The season of advent (Latin Adventus, sc. Redemptoris, " the coming of the Saviour "), is a holy season of the Christian church, the period of preparation for the celebration of the nativity or Christmas. In Eastern Orthodox churches -where it is also called Winter Lent- it lasts 40 days, beginning on November 15, and in other churches from the Sunday nearest to St. Andrew's Day (30th of November) tillChristmas. From the 6th century the season was kept as a period of fasting as strict as that of Lent; but in the Anglican and Lutheran churches the rule is now relaxed. In the Roman Catholic church Advent is still kept as a season of penitence. Dancing and festivities are forbidden, fasting enjoined and (in accordance with the symbolism of liturgical colours) purple vestments are worn in the church services. > Der Weihnachtsfestkreis beginnt mit dem Advent. Er umfasst drei bis vier Wochen; beginnend mit dem Sonntag nach dem 26. November. In diesen Wochen soll sich die Gemeinde vorbereiten auf die beiden weihnachtlichen Hochfeste, an denen das erste Kommen des Gottessohnes zu uns Menschen gefeiert wird. > Dadurch wird unsere Erwartung auch hingelenkt auf die zweite Ankunft (lateinisch adventus) Christi am Ende der Tage. Unter beiden Gesichtspunkten ist der Advent geprägt von hingebender und freudiger Erwartung. Die Gemeinde versammelt sich zu werktäglichen Gottesdiensten, meist "Rorate" genannt. Die Familie sammelt sich um den Adventskranz, dessen Kreisform den Zusammenhalt und dessen wachsendes Licht die zuversichtliche Erwartung der Gläubigen im Advent ausdrückt. In manchen Gegenden gibt es den Brauch des "Frauentragens". Ein Bild der Gottesmutter wird jeden Tag zu einer anderen Familie gebracht. > Der erste Sonntag im Advent ist in seinen Texten geprägt von der Wiederkunft Christi am Letzten Tag. Am zweiten und dritten Sonntag steht die Gestalt Johannes des Täufers vor uns, der die Wege für das Kommen des Herrn bereiten will. Der letzte Sonntag stellt uns Maria vor Augen, die Mutter und Jungfrau, die uns Christus geboren hat. Die erste Lesung ist in den Adventmessen regelmäßig aus den Büchern der Propheten genommen, vor allem aus Jesaja. Links to some nice Advent decorations. All the word mentioned below would make a kigo for advent time haiku. A large catalog. You have to click Weihnachten on the right sidebar to go to these or try some of the items I choose below. and listens into the far. the one night of holiness/glory. eine Motte kreist um ihn;. .. .. .. let it live, Dirk. Advent wreath . . . Advent is the season of preparing for Christmas when Christians celebrate the birth of Jesus Christ. There are four Sundays in the season. 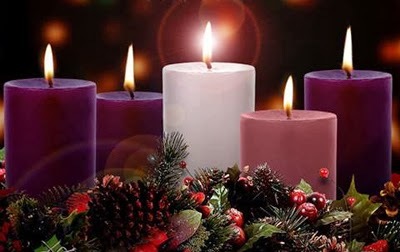 On the first Sunday the Advent Wreath (which carries five - one in the center and four outer candles ; one of which is pink); is placed near the altar and one of the outer candles is lit on each Sunday in Advent. The pink candle is lit on the third Sunday. In Germany, I remember all the candles on the wreath are bright red or sometimes homemade from bees wax, then they are a gentle yellow. The wreath itself is also often homemade. I remember my grandfather preparing one for each of his childres's families as a special gift on the first sunday of advent. On the following links, we can read about different colors and meanings of the candles. The center candle is white and is called the Christ Candle. It is traditionally lighted on Christmas Eve or Day. However, many light it on the Sunday preceding Christmas, with all five candles continuing to be lighted in services through Epiphany (Jan 6). The central location of the Christ Candle reminds us that the incarnation is the heart of the season, giving light to the world. Read a detailed description of the meaning and symbols of the wreath, the colors of the candles and Advent in general. The Advent Wreath is a simple way to honour Advent. By using the symbolic power of candles within the four weeks of Advent, we illustrate that Advent is a time of solemn preparation, that during this time, we are awaiting the Light of the Word and the Dawning of Hope. The origins of the Advent wreath are found in the folk practices of the pre-Christian Germanic peoples who, during the cold December darkness of Eastern Europe, gathered wreaths of evergreen and lighted fires as signs of hope in a coming spring and renewed light. A German Advent custom is the Advent calendar, with 24 little numbered doors in a picture of a Christmassy scene, one of which can be opened on each morning in December. The more luxurious calendars have pieces of chocolate hidden behind the little doors!